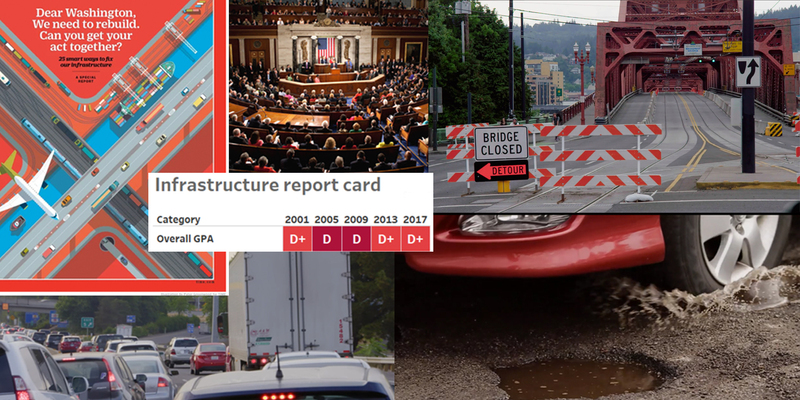 Ah, Infrastructure Week, that magical time of year when we spend seven whole days focused on the vital structures that literally keep us alive – roads, bridges, rail, ports, airports, water and sewer systems, the energy grid, and more. Thanks, invisible support system that we take for granted. You’re the best!! In honor of Infrastructure Week, yesterday we launched #MadMonday on our Facebook, Twitter, and Instagram accounts. Getting back on the road on a Monday morning can be maddening and the hardest part of your work week. What has you stuck in traffic? Congestion? Potholes? Closed lanes? Tell us your story, and let us know what improvements you’d like to see on your local roads. Send a picture or link to a story in your local media. We’d like to hear the good and the bad – what’s got you stuck and what’s happening in your town to get you unstuck. We made Be Prepared to Stop in order to raise awareness and start conversations like these among the people who can really make a difference. That’s you. You depend on roads and bridges. Your taxes pay for their repair, maintenance, and upgrades. You elect the representatives who make decisions that impact the safety of our transportation system. So, let us hear about your personal madness. Then let them hear it. Nothing changes until you demand it!